Cerrado is the name of a tropical fire-prone mosaic of savanna and forest in Brazil. In a recent paper , we showed that in cerrado landscapes, despite the existence of a great variety of community structure (from open savannas to closed forests; Figure below), there are two well-defined stable states of community function, each associated with contrasting levels of community closure (open and closed environments) and maintained by different fire regimes. 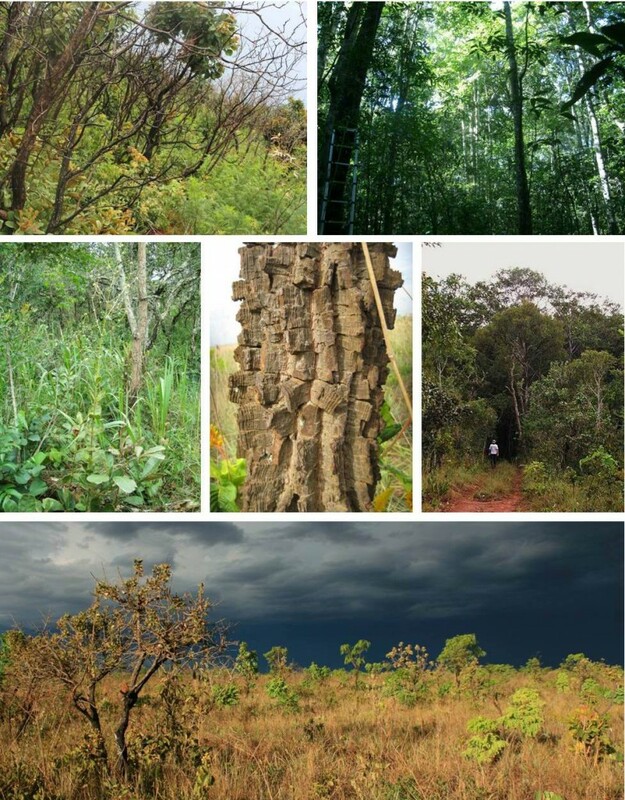 Soil properties, phylogenetic and non-phylogenetic beta-diversities, and most of the plant functional traits presented a threshold pattern along the community closure gradient with coinciding breakpoints, providing strong evidence of a functional threshold along the forest-savanna gradient. Open environments consisted of communities growing on poor soil and dominated by short species with early investments in thick barks, low wood density and with thick and tough leaves (high toughness and low specific area). In contrast, closed communities grow in more fertile soils and include plants having the opposite functional attributes. Moreover, we found contrasting fire regimes on the two sides of the threshold, with open formations showing shorter fire intervals than closed formations and a switch from communities dominated by fire-resistant plants to communities dominated by shade tolerant species that compensate for their lack of fire resistance by efficiently closing the canopy (i.e., reducing flammability). Overall, these results are consistent with the theoretical model of fire-plant feedbacks as main drivers of the coexistence of two stable states, savanna and forest. In this context, we provide the first field-based evidence for a community-level threshold separating two vegetation states with distinct functional and phylogenetic characteristics and associated with different fire regimes. Top: A woodland cerrado (cerrado sensu stricto) six months after a fire, with several top-killed trees and a developed layer of resprouting vegetation; and one of the sampled closed forests. Middle: A dense woodland cerrado (cerrado denso); one example of a typical thick-barked species found in open communities (Anadenanthera peregrina (Benth.) Reis, Fabaceae); a transitional zone between dense savannas and forests. Bottom: A typical open savanna at the early rainy season, with tall flammable grasses and small trees and shrubs. Photo credits: V. Dantas, G. Sartori, V. Cadry, J.G. Pausas, F. Noronha, A. Favari. See . Woody plants of the Mediterranean Basin can be classified in two contrasted morpho-functional syndromes : a) plants with sclerophyllous, evergreen leaves and small, unisexual greenish or brownish flowers with a reduced perianth, and large seeds dispersed by vertebrates; and b) plants with alternative character states (non-sclerophyllous deciduous, semi-deciduous or summer deciduous species with large and conspicuous flowers pollinated by insects, and small seeds). The sclerophyllous syndrorme (a) occurs in clades whose characteristics pre-date the appearance of the mediterranean climate while the non-sclerophyllous syndrome (b) arose in clades that have evolved after the emergence of this distinctive climate (Tertiary – Quaternary transition). 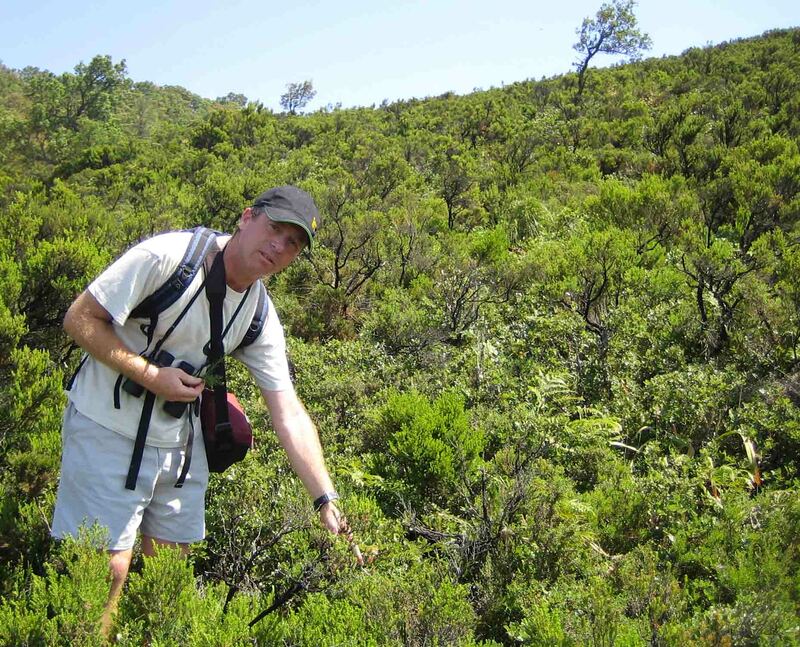 A recent phylogenetic study  show that during the time with prevalent mediterranean climate, lineages with the non-sclefophyllous syndrome showed a higher speciation rate than the sclerophyllous lineages, suggesting that a syndrome-driven local diversification has occurred in shrublands under mediterranean conditions. The processes behind this result might be divers, but fire might had an important role. The rise of mediterranean climate increased fire activity  and traits defining these two syndromes are related to post-fire regeneration traits and to the age to maturity [4,5]. The non-sclerophyllous syndrome is associated with species considered post-fire seeders (i.e., killed by fire in which populations regenerate from a persistent seed bank; fire-stimulated germination [6,7]) and to species with early maturation. In fire-prone ecosystems, these characteristics reduce the generation time and the overlap between generations and thus they provide more opportunities for diversification. Overall, the results provide an example of how the integration of the environmental filter in a dated phylogeny may recreate the local history of lineages and help to explain assembly processes in mediterranean ecosystems. Figure: Frequency distribution of differences in local speciation rate (λ) between non-sclerophyllous (n) and sclerophyllous (s) syndromes in the Valencia woody flora for 3 different post cut temporal slices (cutoff of 10, 6, and 3.6 My) related to the increasing aridity associated with the rise of mediterranean climate. For all alternative phylogenies (i.e., accounting for the undertainity in node age), speciation rate of the non-sclerophyllous syndrome is greater than for the sclerophyllous one. See Verdú & Pausas (2013) for details . Herrera, CM. 1992. Historical effects and sorting processes as explanations for contemporary ecological patterns: character syndromes in Mediterranean woody plants. Am. Nat. 140:421-446. How old are wildfires? Probably as old as terrestrial ecosystems . The origin of fire is tied to the origin of land plants, which are responsible for two of the three elements essential to the existence of fire: oxygen and fuel. The third element, a heat source, has probably been available throughout the history of the planet (mainly through lightning). There is charcoal evidencs of fires already in the Silurian (440 Ma). However, the existence of fire does not necessarily mean that fire was playing an evolutionary role at that time. So when did fire start to play an evolutionary role generating fire adaptations [2, 3]? By mapping fire adaptation onto a dated phylogeny of Pinaceae, we recently demonstrated  that at least, and for this family, fire was an agent of natural selection since about 90-125 Ma! This is far back from what was known until now . 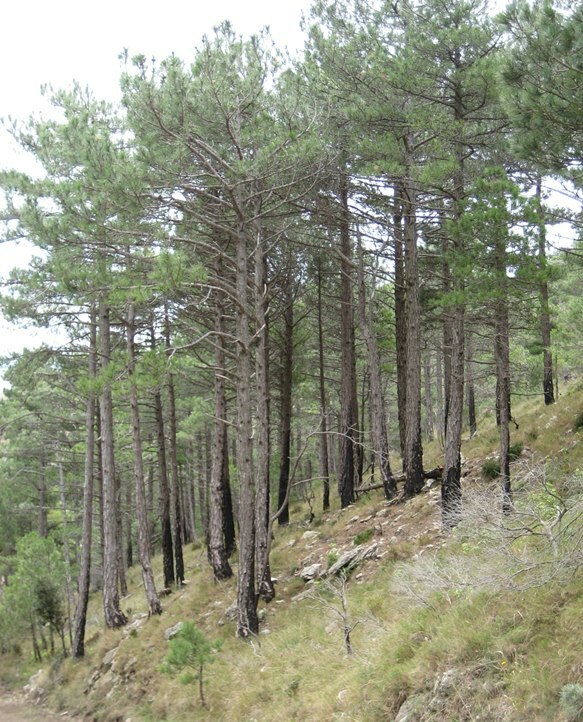 At this time, fire-protective thick barks were originated in Pinus species as response to surface fires. With increasing fire intensity, thicker barks and serotiny appeared by 70-90 Ma. These innovations appear at the same time as the Earth’s paleoatmosphere experienced elevated oxygen levels that led to high burn probabilities (mid-Cretaceous). That is, the fiery environments of the Cretaceous strongly influenced trait evolution in Pinus. Whether fire had an evolutionary role prior to this is a challance for future research. Traditionally wildfires were considered a disturbance linked to the recent history of the Quaternary, and specially linked to the humans. However, evidence are accumulating about the ancient role of wildfires in terrestrial ecosystems . In Australia, the flammable continent, the current believe is that fires started to be important during the onset of seasonal aridity in the Miocene (25 Ma). However, two recent and independent papers demonstrate, using phylogenetic techniques, that fire-dependent traits appeared about 60 Ma ago (early Paleocene), implying that fire was already an effective agent of selection by then. Crisp et al  studied the Myrtaceae family and showed that post-fire epicormic resprouting (typical of many eucalypts) is an ancient trait linked to the flammable sclerophyll biomes originated about 60-62 Ma. He et al. 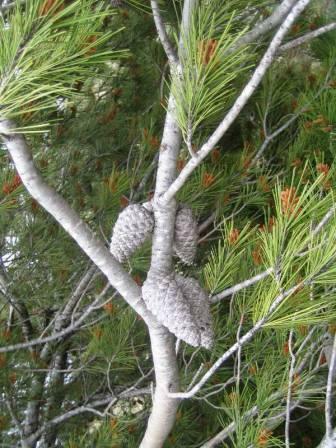 studied the Banksia genus (Proteaceae) and showed that serotiny (fire dependent dispersal; figure below) and dead floret retention around the cones (enhanced flammability around serotinous cones) co-originate with the first appearance of Banksia 60.8 Ma ago. The coincidence of the two independent papers, using two different taxa (Myrtaceae and Banksia) is amazing, and clearly suggests that fire was a selective force in Australia during the Paleocene. These papers are part of the accumulating research on the prominent and ancient role of fire in shaping plant species and biodiversity [1, 4 ]. 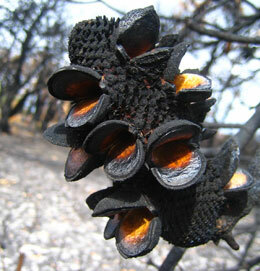 Figure: Banksia cone opened by the fire to release seeds (serotiny). Why so many desert plant communities are dominated by spiny species, most of them cacti? The first observation refers to the community’s phenotypic structure and the second to its phylogenetic structure. What do these observations tell us about the mechanisms assembling these communities? The way communities are assembled is an old ecological question currently experiencing renewed interest thanks to the recent advances in molecular biology and phylogenetics. The generality of these new methods has allowed us to understand the structure of communities of organisms from different kingdoms and at different scales. Concomitant with this growing interest, new methods, metrics, terms, and software have appeared that independently solve similar questions, but with different approaches. 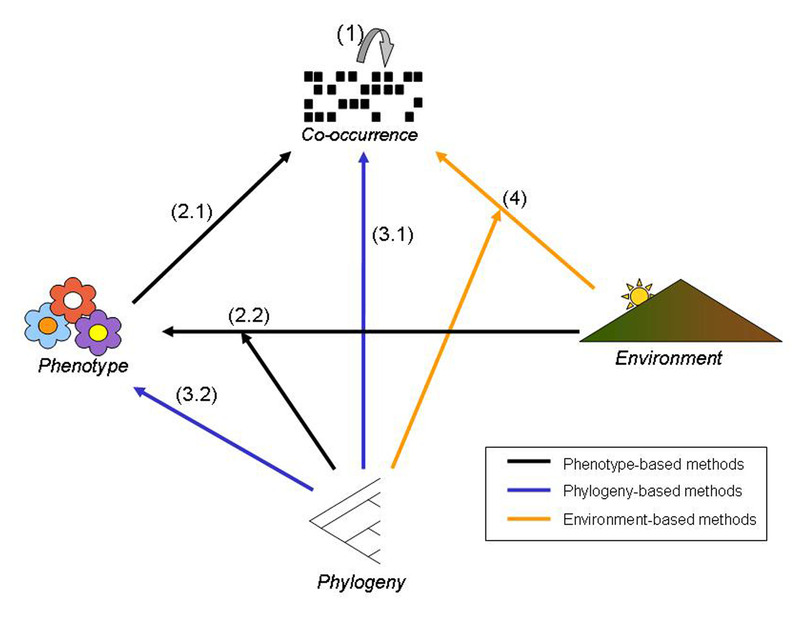 In this new paper we provide a unifying framework on methods for community structure based on the relationships between four key concepts: phylogeny, phenotype, environment, and co-occurrence. The different approaches are based on different community representations of traits, the phylogenetic relationships of species in the community, or species occurrence along the environmental gradients. We finally provide insights on future directions of this emerging discipline. (2.1) Relationship between the species’ phenotypes and their co-occurrence (phenotypic community structure). (2.2) Relationship between species response to the environment and the species phenotypes, controlling by the species’ phylogenetic relatedness (phenotypic community structure). (3.1) Relationship between the species’ phylogenetic relationships and their co-occurrence (phylogenetic community structure). (3.2) Relationship between the species’ phenotypes and their phylogenetic relationships (trait evolution). (4) Environment-based approach: relationship between species response to the environment and the co-occurrence, considering the phylogenetic relatedness (phylogenetic community structure). See previous post [link] on the effect of fire in phenotypic and phylogenetic structure of communities. Mediterranean communities living under high fire recurrence are composed by plant species that are more closely related than what would be expected from the regional species pool (i.e., phylogenetic clustering; Verdú & Pausas 2007). This is because high fire recurrence favors seeder species, and the traits that confer the seeder character (e.g., heat and smoke stimulated germination, Moreira et al. 2010) are evolutionary conserved, that is, closely related species tend to be similar (Pausas & Verdú 2008). In fact, the abundance of seeders species is negatively related to phylogenetic diversity (Coca & Pausas 2009; see Figure 2 below). 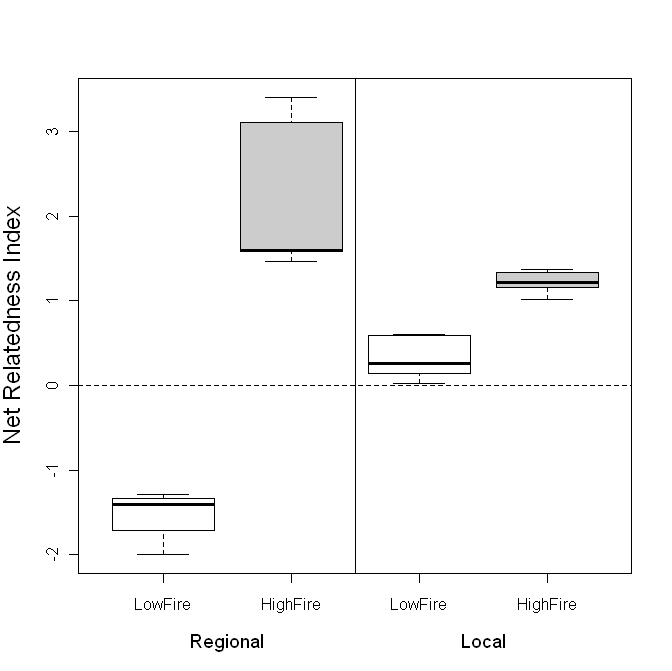 The Figure 1 below shows the Net Relatedness Index (NRI, i.e, standardized form of the community mean phylogenetic distance) of woody species coexisting in for communities in contrasted crown-fire regimes (LowFire vs HighFire) at different spatial scales (regional and local). Note that high net relatedness = low mean phylogenetic distance. At regional scale, “LowFire” corresponds to mountain communities living in zones that rarely burnt, and “HighFire” are warm and dry coastal communities subject to a high frequency of crown fires. At local scale (under the same climate), “LowFire” corresponds to communities growing in fertile soils while “HighFire” are communities growing on poor soils where flammability is higher. When comparing from community null models, HighFire communities show higher NRI than expected by chance (phylogenetic clustering), which indicates the importance of habitat filtering in shaping fire-prone communities (Verdú & Pausas 2007, Ojeda et al. 2010). Fig. 1. Elaborated from Verdú & Pausas (2007) and Ojeda et al. (2010). Fig. 2. From Coca & Pausas (2009). Recurrent wildfires constitute a major selecting force in shaping the structure of plant communities. At the regional scale, fire favours phenotypic and phylogenetic clustering in Mediterranean woody plant communities. Nevertheless, the incidence of fire within a fire-prone region may present strong variations at the local, landscape scale. This study tests the prediction that woody communities on acid, nutrient-poor soils should exhibit more pronounced phenotypic and phylogenetic clustering patterns than woody communities on fertile soils, as a consequence of their higher flammability and, hence, presumably higher propensity to recurrent fire. Results confirm the predictions and show that habitat filtering driven by fire may be detected even in local communities from an already fire-filtered regional flora. They also provide a new perspective from which to consider a preponderant role of fire as a key evolutionary force in acid, infertile Mediterranean heathlands. The first author in the flammable, low fertility community. Question: What factors determine the deviations from the relationship between species richness (which considers species as independent entities) and phylogenetic diversity (PD) (which considers species relatedness)? What are the implications for community composition and phylogenetic structure? Location: Los Alcornocales Natural Park, in southern Iberian Peninsula (Spain). Methods: We recorded all woody species and geographical features on 94 (20 m × 20 m) plots of cork oak woodlands. Disturbance information was obtained from the Park records; precipitation was estimated from local maps. PD was computed as the minimum total length of all the phylogenetic branches spanning the set of species on each site. Then, PD was regressed against species richness to test to what extent the unexplained variance in this relationship could be accounted for by environmental variables and disturbances, and against the representation of species with different regeneration strategies. 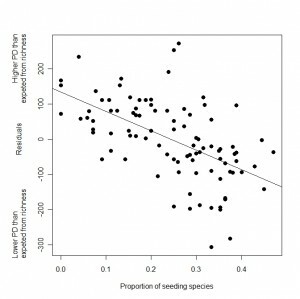 Results: Species richness and PD are strongly related; however, the remaining variability can be explained by: (1) precipitation and disturbance, and (2) the proportion of seeder species. Thus, the PD both of areas with low precipitation and high disturbance, and of areas with a high representation of seeder species, is lower than what would be expected from the species richness. Conclusions: Regeneration traits are important in structuring plant community composition; specifically, they contribute to shaping biodiversity in Mediterranean ecosystems. Species richness tends to overestimate biodiversity in highly disturbed systems. 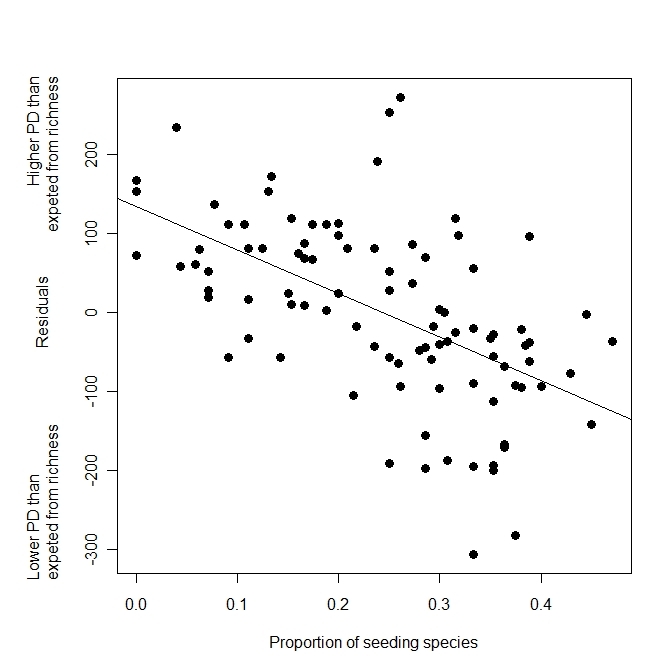 The relationship between the residuals from the phylodiversity-species richness regression, and the proportion of post-disturbance seeding species (P+; r= -0.560, p< 0.0001). Negative residuals indicate lower phylogenetic diversity than expected from species richness values, that is, a tendency for phylogenetic clustering.